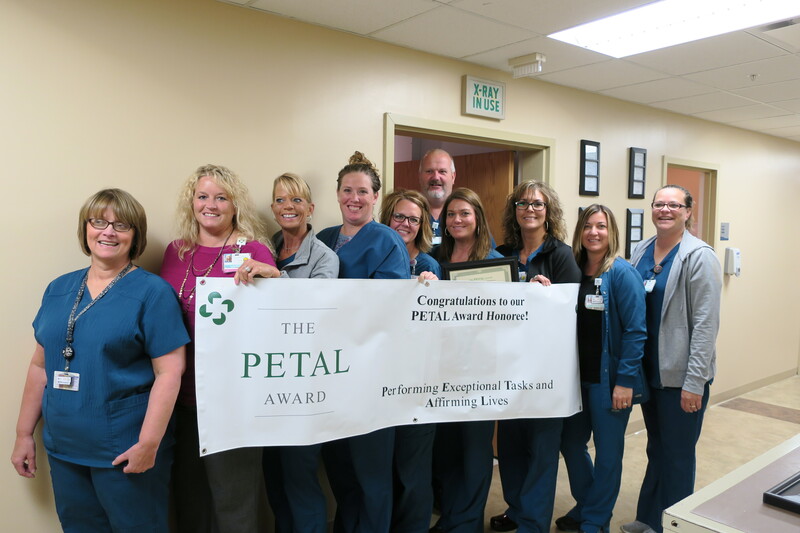 Non-nursing staff are being honored with the PETAL Award for exceptional employees. A compliment to the DAISY Award for Extraordinary Nurses, the PETAL Awards were created by Greene County General Hospital in 2015 to recognize the hard work of employees in non-nursing roles, from housekeeping and dietary services to clinical areas. Award winners receive framed certificates, gift cards, and pizza for their entire department. PETAL Winner, Melissa Toon (2nd from rt), is flanked by members her staff in the pharmacy as well as GCGH CEO, Brenda Reetz. 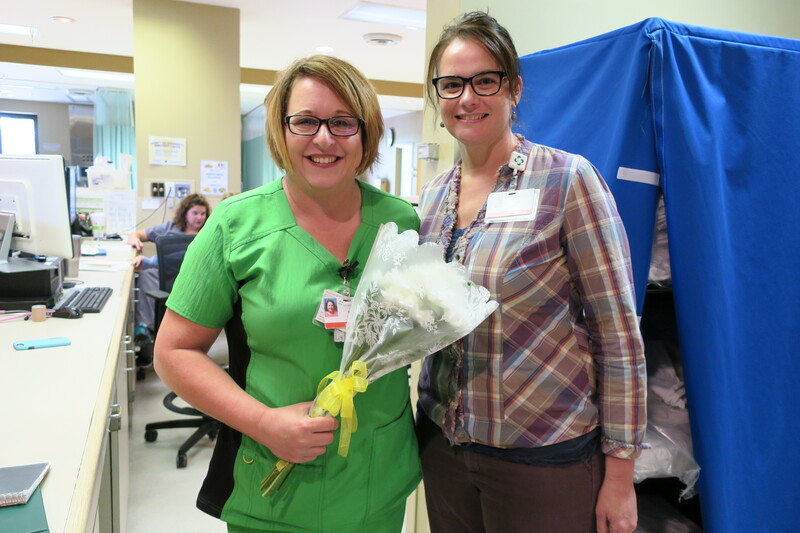 PETAL Winner, Danielle Bredeweg (4th from rt) is surrounded by coworkers from the GCGH Radiology Department. This round of awards recognized winners Danielle Bredeweg (Radiology) and Melissa Toon (Pharmacy). Danielle was honored by a coworker who credited her with saving her life when she choked while eating dinner in the break room. 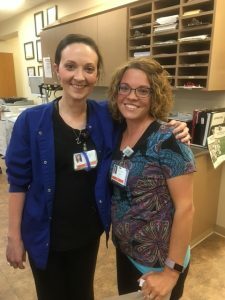 She signaled to Danielle that she was in distress, and Danielle successfully performed the Heimlich Maneuver to save her friend. 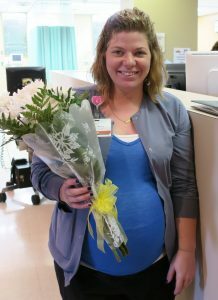 Melissa was nominated by the spouse of a patient who was in the ICU and had to be transferred to another hospital for additional care. 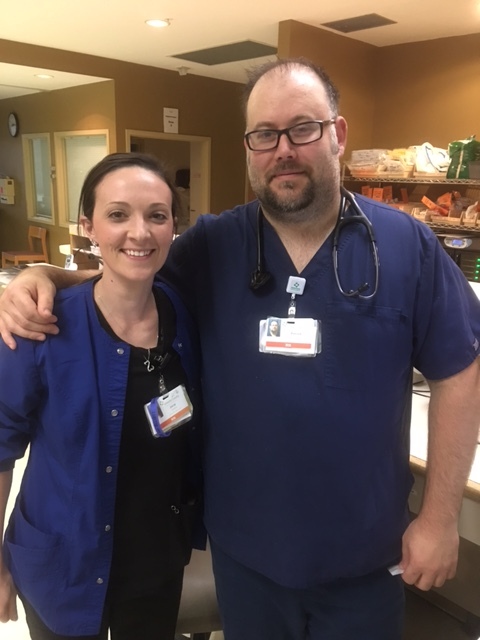 The medication and dosage was complicated, and Melissa took great pains to ensure everything was correct and that the next point of care understood exactly how to care for the patient. 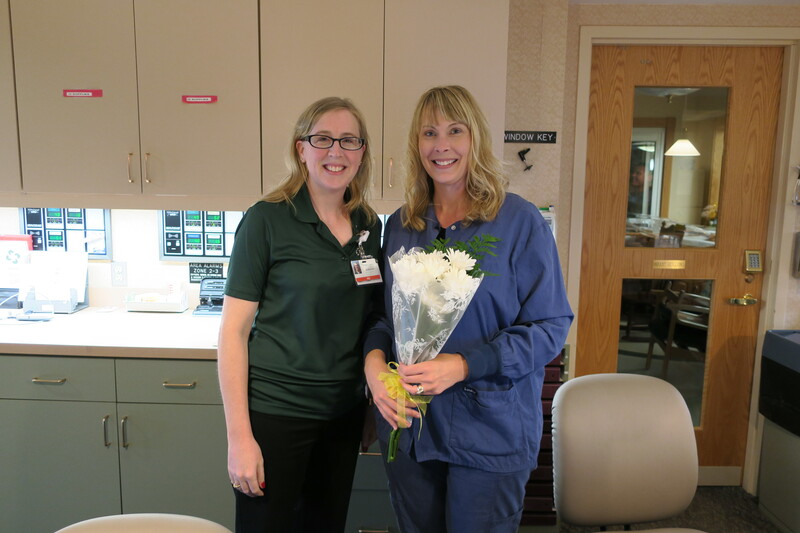 She also took time to explain everything to the patient’s spouse and accompanied them to the helipad for transfer. 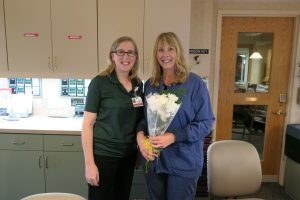 Additional nominations were received for staff throughout the hospital, including Jessie Stockram, Danielle Summerville, Megan Sparks, Joyce Busenberg, and Meleah Keller. Congratulations to all winners and nominees! 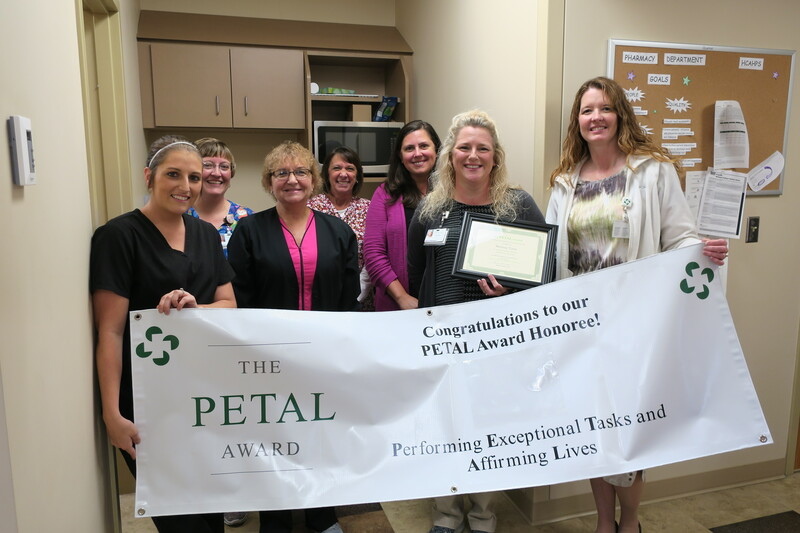 PETALs are awarded three times every year, in conjunction with the DAISY Award. Nominations are accepted on a continual basis, and forms can be found at award stations throughout the hospital as well as online. Greene County General Hospital CEO, Brenda Reetz, announced today that hospital operations will be unaffected during the final stage of facility repairs during which a section of the ground floor will be closed. The main hallway on the ground floor between the cafeteria and the elevators will be closed June 12-21. The cafeteria will continue to serve as usual, however, visitors will only be able to enter through the main glass doors, opening into the lower level parking lot. The south doors next to the handicapped parking will be closed as will the ground floor restrooms. Public restrooms will be available on the first floor, between the outpatient laboratory and emergency department registration. Elevators will continue to operate normally, with access on the ground floor limited to the back utility hall. Administrative offices will be relocated within the hospital, and phone numbers will remain unchanged. The parking lots will be unaffected. On Wednesday, March 29th, Greene County General Hospital will host a unique display for all ages. In honor of Colon Cancer Awareness Month and with the help of Dr. Rajiv Sharma, Greene County General Hospital is proud to host a large, inflatable colon model will be on display in the hospital’s parking lot between the hours of 10:30 am and 2:00 pm. Large enough to walk through, visitors can learn about this important organ and the preventative care that can keep it healthy and functional. The display is open to the public. No reservation or appointments are necessary. Please mark your calendars and plan to visit! Don’t miss this great educational opportunity! 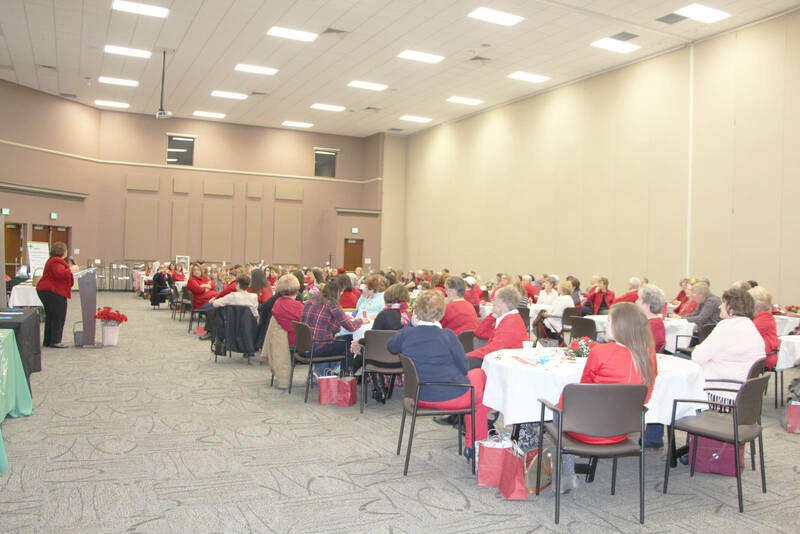 We were proud to be a major sponsor for the second, annual Go Red for Women heart health luncheon for Greene County. This inspiring event was another fun time to gather together and raise money to fight back against heart disease. Our annual gun raffle is going on now! 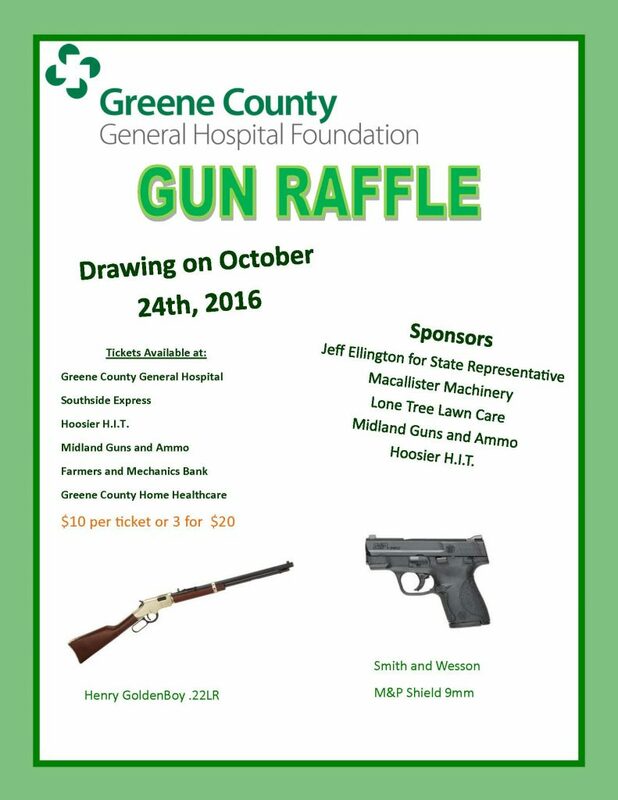 Tickets are available at Greene County General Hospital, Southside Express, Hoosier H.I.T., Midland Guns and Ammo, Farmers and Mechanics Bank, and Greene County Home Healthcare. $10 each or 3 for $20. Drawing will be held October 24th, 2016. Thank you to our sponsors! Jeff Ellington for State Representative, Macallister Machinery, Lone Tree Lawn Care, Midland Guns and Ammo, and Hoosier H.I.T. Thank you for your support! 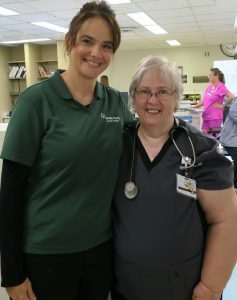 Greene County General Hospital is proud to support the Indiana Hospital Association’s We Care. We Vote. campaign. 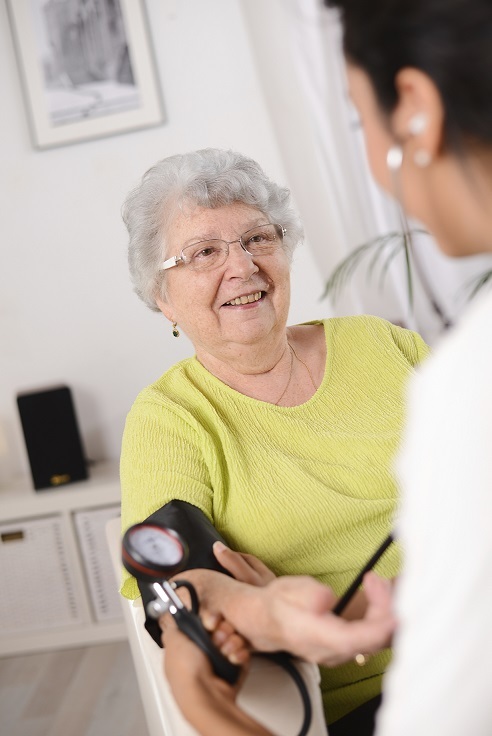 Health care policy is a huge area of public concern, and we want our elected officials to know and understand how their decisions impact the front lines of health care. That means we are working to ensure every employee is registered to vote before the October 11 deadline, and that our employees have as much information as possible about the current roster of candidates. Every Friday, we will host a voter registration table outside of the cafeteria during normal lunch hours (11:30 am -1:30 pm). Find us just outside the cafeteria with a table full of candidate information and a big stack of voter registration forms. We will turn in every registration form we receive, regardless of whether you are a Greene County resident. Come one , come all! Get registered, and get out to the polls to vote this year! 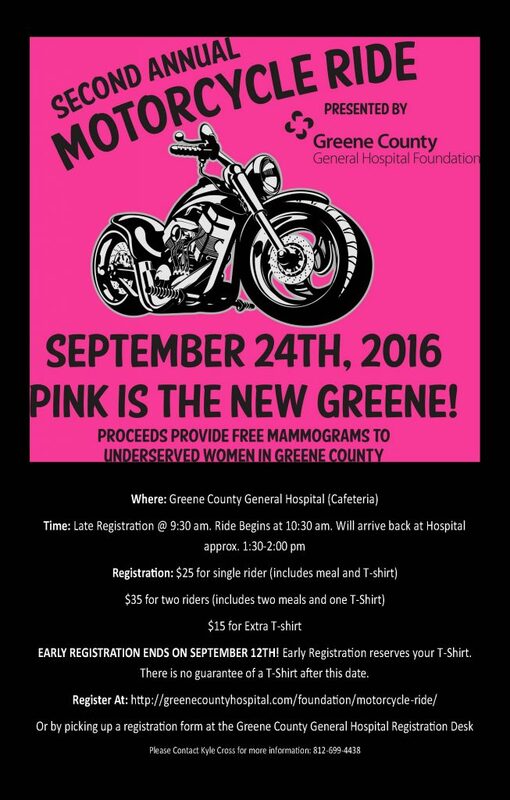 Join us for the second, annual Pink is the New Greene Motorcycle Ride, September 24th, 2016! All proceeds will fund free or reduced-cost mammograms for women in need in our communities. The Greene County Court Appointed Special Advocate (CASA) Program will hold its Spring Training and Informational Meeting at 6 p.m. on Monday, March 17 in the banquet room of Linton’s Goosepond Pizza. During the meeting, potential volunteers will learn about the CASA Program, which advocates for children who have been abused or neglected. Once the court determines that a child is a Child in Need of Services (CHINS), the CASA volunteer focuses completely on that child. The Greene County CASA Program currently has a waitlist of nine cases, and Director Samantha Flath said they are looking for the right people to serve as the voice of each child throughout his or her court case. “Volunteers must be adults who are honest, caring people and are willing to be trained for this important job. Training consists of the Role of a CASA Volunteer, the DCS and Court System, Child Abuse and Neglect, and Understanding the Children and Families CASAs work with. Many current CASAs are employed full-time, attending college, and married with children. It is a wonderful way to make a difference in the life of a child,” she noted. A CASA must complete 30 hours of training, and the volunteers determine the training schedule as a group. Applicants must be at least 21 years old, give consent for a background check, and provide three references. Flath said that while being a CASA can be difficult at times, volunteers can change a child’s life in ways that are rewarding to both the CASA and, most importantly, the child. “A CASA is the only person involved in the child’s life that advocates and supports the child that does not get paid for their work. CASAs also help ensure the child will live in a safe and permanent home in a timely manner, whether that is through reunification with their biological parents or adoption,” she stated. If you’d like to learn more or request a CASA application, you may call Director Samantha Flath at 812-384-2036. The Greene County Republican Women’s Club sponsored a ham and bean dinner at the 4-H Fairgrounds on Saturday. President Karen Abrams explained that the club initially discussed holding a fundraiser, but instead decided to aim for building teamwork and increasing participation. “We kind of died out over the years and we’re trying to get some more people involved and some younger people involved. That’s kind of tough to do, since there is so much competing for attention,” she noted, adding that she was pleased with the dinner’s turnout. One notable guest was Kelly Mitchell, who is currently running for Treasurer of State. Mitchell, who has worked in the State Treasurer’s Office since November of 2007, was in Greene County as part of a tour that included five different locations on Saturday. She said the duty of the treasurer is to invest the public’s funds and keep them safe and ready to be used when they are needed. Mitchell currently runs Trust Indiana, the state’s local government investment pool. Mitchell also directs six to ten public funds management seminars each year, which are free to appointed and elected fiscal officials. The seminars are aimed at teaching the officials about the ways the treasurer’s office can help make their lives easier. Mitchell, who was preparing to head to an event in Clay County, said she loves traveling the state and talking to people. She noted that running for office is a big undertaking, though. “It’s not just about you, it’s about your family and your career and everything comes in to play. But I’m running because the treasurer’s office is a dynamic and challenging and really rewarding place for public service. It’s a fantastic place to be and I know I can do a very good job for the people of Indiana in that office,” Mitchell stated, adding that she formerly served two terms as a Cass County Commissioner and would therefore bring local government experience to the job. Current Greene County Commissioner President Rick Graves, who is running for re-election, also stopped by the dinner. He said he enjoys being a commissioner and that his favorite part of the job is coordinating the efforts of cities, towns, and the county. Graves said the nature of local government has recently gone through many changes and commended all the residents who are doing good things for the community, adding that it is a fun time to be involved in county government even though serving as a commissioner is not exactly your average part-time job. County Recorder Stuart Dowden is also running for re-election, and also excited by the work that comes with the office. He said he has achieved a lot in his position but still has plenty of work left to do in what he considers to be the most important county office. Dowden’s job is to preserve and protect those documents. He said one way he has done that is by spending a little over three years computerizing information from 1960 through 1994– a process that should be completed in June or July of this year. Dowden, who said his favorite part of his job is finding and fixing problems, hopes for a chance to preserve more documents during a second term. He is excited about the new website the county is developing, and noted that his part of it is ready to go and just needs to be submitted. “It is for getting people access to go online and search for stuff for a fee– or they can look on the website and get information instead of coming into the office and maybe finding out they don’t have everything they need. We’re trying to get the right information on there, so they can just look on there first and know that in order to make a document they need to have this, this, and this done,” Dowden explained. 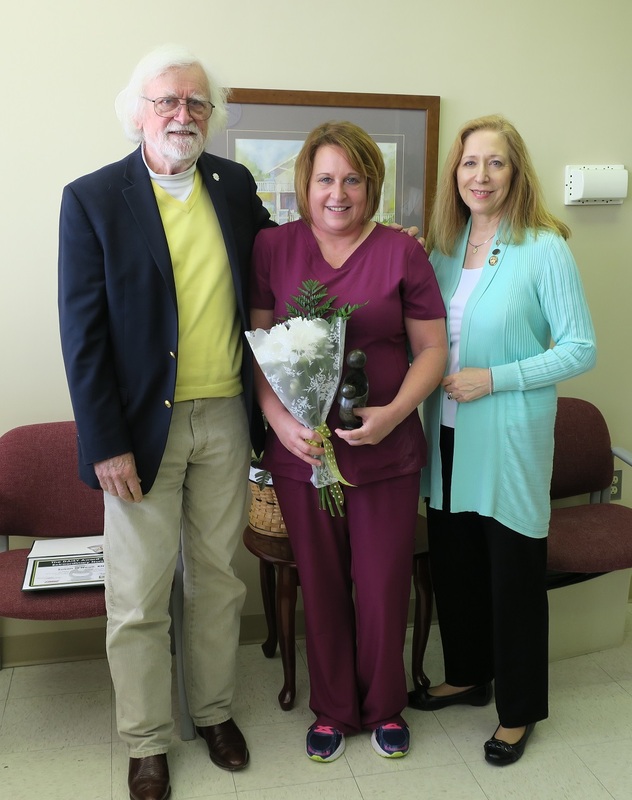 Republican Women’s Club Secretary Kelly Zimmerly, who has served as the Greene County Treasurer since January of last year, added that the treasurer’s office has been an interesting place lately, too. This is partly because of the decision to use a collection agency to reclaim $600,000 in personal property taxes that have been unpaid for the last decade. The office is also gearing up for the new tax season, and Zimmerly said you should notice some changes in your tax statements this year, including the fact that they will arrive in colored envelopes. “Hopefully that will be helpful, because we’ve had some people come in to pay their fall installment and say they’ve misplaced their tax statements. We’re thinking a colored envelope might help so that they’ll know where their tax bill is,” she noted. Zimmerly said the envelopes will now also notify people that they may choose to make partial payments for their taxes, and ask them to include their phone numbers on their checks. As politicians and supporters networked, discussed county business, and enjoyed dinner, Abrams hoped that her club can continue to draw people together and hold their interest. If you would like to learn more about the Republican Women’s Club, you may contact President Karen Abrams at ksa5024@hotmail.com, Secretary Rhonda Dowden at rldowden@gmail.com, or Treasurer Kelly Zimmerly at zim5@bluemarble.net.